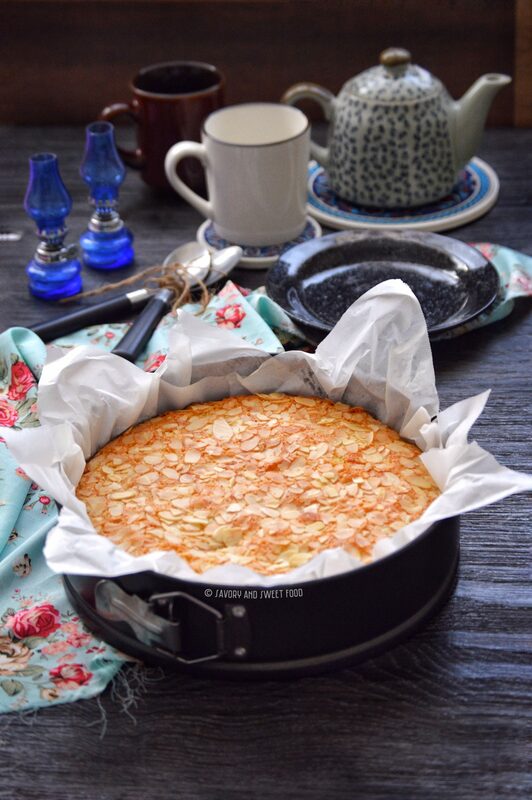 A Gluten Free Flourless Almond and Coconut Cake that’s moist, tender and incredibly delicious. It takes just few minutes to whip up this recipe, best for busy days. 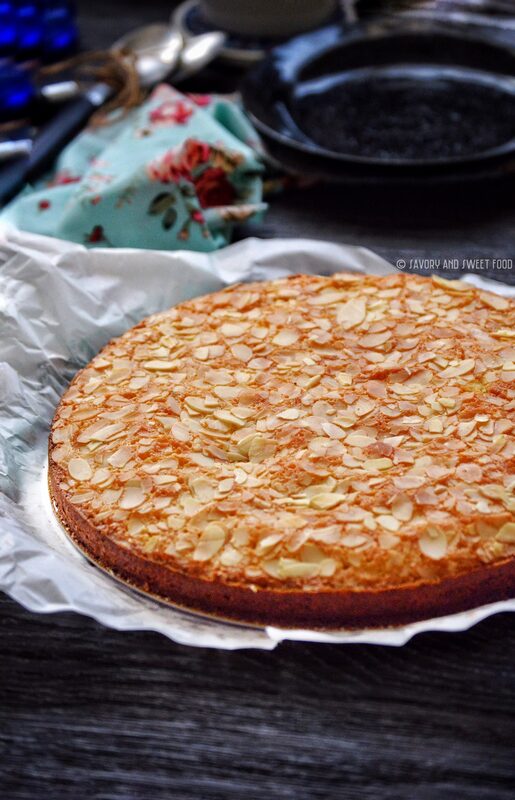 I love this cake, the texture of this cake is ethereal – it’s so moist and buttery with the rich flavor from the almonds and coconut. Its more like the Arabic dessert, Basbousa. All those people who are allergic to gluten (like me), this recipe is for you. My sister is the one who introduced this cake into our lives. There was a time, about 1 year back when me and my brother were extremely allergic to gluten and dairy. So we had to cut down these two culprits for one whole month. That was one depressing month for me. My sister used to try out different gluten-free recipes and when we visited her house she served this to us and we were too delighted after having a little piece of awesomeness. Even though it had dairy in it, I didn’t care. I ate a whole lot of this cake that day. This recipe originally belongs to Belinda Jeffery, who blogs at belindajeffery.com. You guys should check out her space, she has got some amazing collection of recipes. I can’t thank her enough for this lovely recipe. 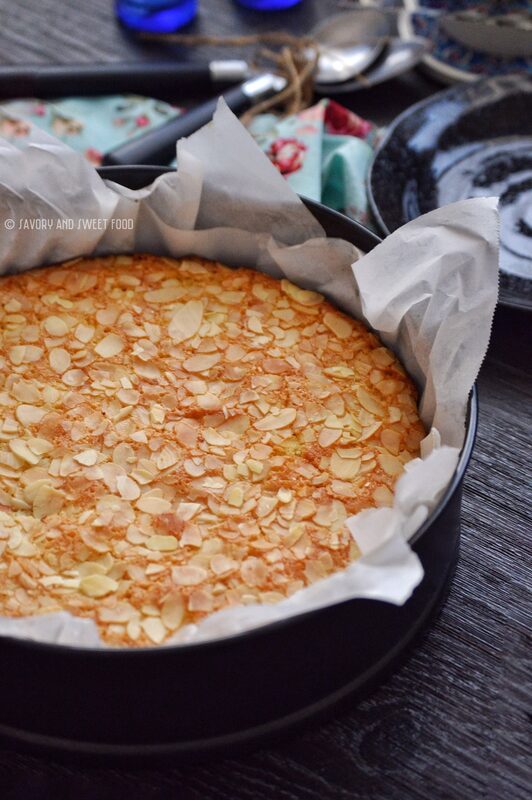 I make this cake very often at home, please do try this out. It will be a regular at your place too. This cake freezes very well. You just have to thaw or microwave it when you need it. It stays in the fridge fresh for a week. You just have to warm it or bring it to room temperature just before eating it. I like to eat this cake warm. Instead of almond flakes you can use pistachio flakes too. Butter a 23-24cm springform cake tray and line the base and sides with buttered baking paper. Or butter the base and sides well and dust with flour and keep aside. In a bowl add almond powder, coconut, salt and sugar and stir well with a whisk until combined well. 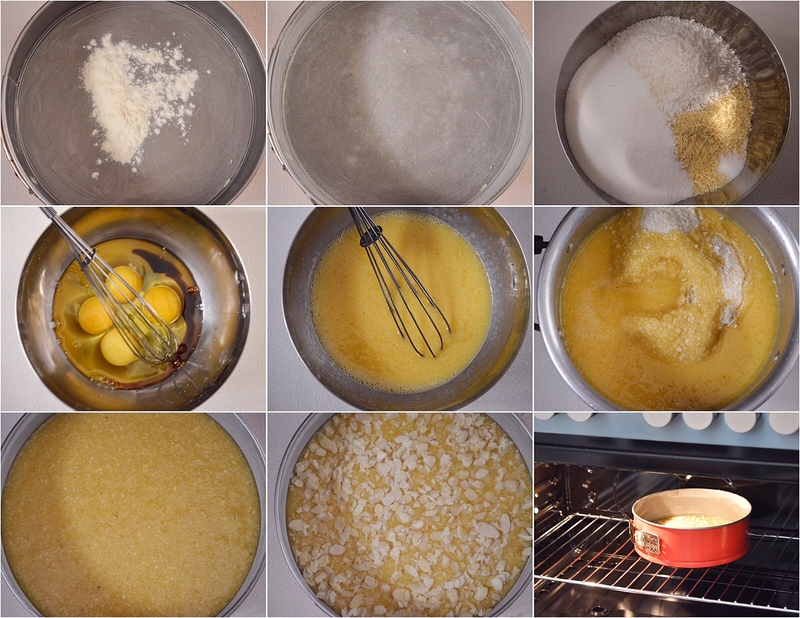 In another bowl, whisk together the eggs, vanilla essence till properly mixed. Then add in the cooled butter and mix till it is completely incorporated. Tip the butter mixture into the almond mix and stir them together. The batter will be quite loose. Pour this into the prepared baking pan and spread it out evenly. 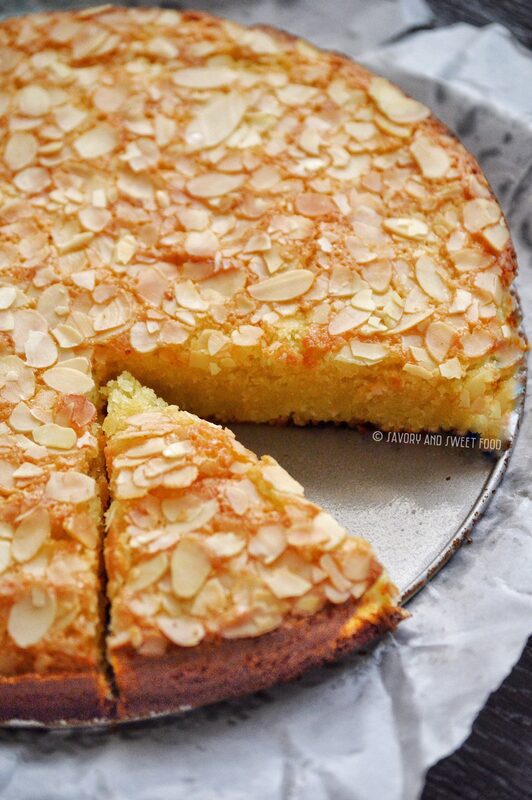 Scatter the almond flakes on top. Bake in the oven for 40 minutes or until the top of the cake springs back slowly when you press it gently. Cool the cake inside the tin on a wire wrack. Once the cake gets cooled, invert it onto the rack, remove the baking paper and invert it again onto the serving plate. Sprinkle icing sugar on top if desired. thank you Asheera! Hope you will give this one a try. Almond powder will be available in most supermarkets Don. Do check in the nuts section, they’ll sell it loose as well as ready packed and sealed. When you say Almond Flakes are you talking about a cereal similar to Frosted Flakes? Or is this like Almond Flour? Looks Amazing! I’m excited to try it. Hey Jan. So sorry for the late reply. No dear, almond powder used here is same as almond flour. Almond flakes are thinly sliced almonds. Is almond powder the same as almond flour? Yes Terry, it’s the same. Thank you for the recipe, this cake is awesome! Everyone loved it. Not dry at all. So easy to make as well. Thank you so much Laura for trying and also for sending the feedback. If I was to use salted butter but also leave out the salt, do you think that would work out OK? Looking forward to making this and I am Gluten Intolerant. Hey Anna. I suggest you use unsalted butter. Hope you do make this and enjoy it. This recipe is delicious! I can’t eat sugar so substituted swerve in place of the sugar. It makes for a perfect flourless and sugarless treat! It is a family favorite now! Thank you! Can I make in this in a regular round cake pan? I don’t have a springform pan. Looks like I’ll be able to make some easy vegan switches! 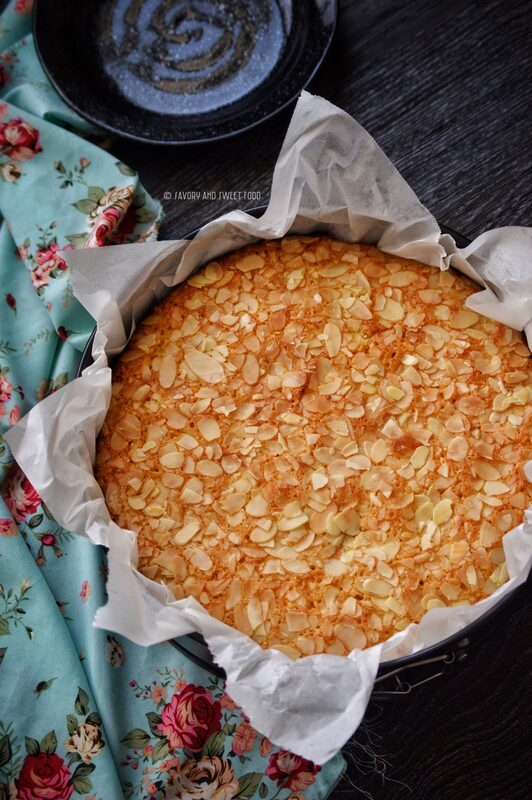 Almond and coconut is a dangerous combination! This was so delicious and seemed to disappear so quickly. Will definitely be making it again! You may want to try using oil, since the butter is melted. I’m not a baker but this sounded so good and easy I had to do it. After buying a cake tin plus all other ingredients I started off and as you said it is very easy to make and it came out perfectly moist and yummy! The only difference I made was cooking it for 30 mins as opposed to 40 mins. EVERYONE loved it!! Thank you very much! Hi is Almond powder the same as almond meal or ground almond? Yes Radhia, it’s the same. Yes, you can make your own almond flour by grinding raw or blanched (skin removed) almonds. Just make sure that you only pulse it for few seconds. If you grind for long, the nuts will start releasing oil. After pulsing, sift the flour to remove any chunks of almond. I don’t eat eggs- can they be left out? I’ve made cakes without them before. Egg is a very important ingredient in this recipe. The cake won’t turn out well without it Matilda. Oh that’s a shame. Never mind- I will imagine eating it! I wonder if you could substitute the eggs with Aquafaba? Has any of you vegans out there found replacements for the eggs and butter? Lovely cake, moist and sweet. I will try reducing the sugar next time. Definitely will be making this over and over again. Thanks very much for sharing. Caster sugar is fine sugar. The granules will be super fine. Can you use granulated sweetener instead of sugar? I have not tried with it. But I think it would be ok. Give it a try. Is almond powder the same as almond meal? Made this cake to bring to a get together. Wow, it wowed everyone. Delicious & so moist. I did add 1tsp of almond extract ti the mix. This is a 5 star recipe for sure, & I am going to tell you why. First of all, there are no “odd” ingredients one needs to go buy. You likely have all you need in your house, & if you don’t, the ingredients aren’t so obscure that you will only use them once and never again. The recipe is simple to make and easy to follow. The finished product tasted great and was nice enough to use as a birthday cake and so I was easily able to write happy birthday on it with a Bailey’s Irish buttercream frosting. Yummy! Although I have not froze it, I can tell that it would freeze nicely. The only problem I had was it made a mess in my oven. I lined the spring form pan with one sheet of parchment on the bottom and a thin long piece around the sides. Although the cake turned out beautifully, the excess butter, as it heated in the oven dripped and made a smoky sticky mess. So next time I would either line a baking sheet with foil to catch the drips or use one complete piece of parchment in the bottom. I guess you could also use another type of baking dish that doesn’t allow for seepage. I wonder if using one piece of parchment in the bottom would still form a nice even round edge? Anyway, this was a really great recipe, so thanks so much for posting it! Do you have this recipe converted to cups and oz. and temperature. It sounds yummy just having a hard time converting. I’m gluten free so it was a treat something that tasted this good. Amazing. I’m making this for a women’s retreat this weekend. Could I make this in a 13×9 in. cake pan? Or what size would you recommend. Just think I could get more servings out of it. If not I’ll just freeze and cut and hopefully get plenty of slices out of it. Thanks for sharing this delicious cake. This looks amazing! I’d like to substitute the sugar with xylitol, but not sure if I should adjust the liquids? What can we use instead of eggs in this recipe. You can’t skip eggs in this Priya. Can you please convert the recipe to cups instead of grams. Explaining the icing sugar too. Oh that’s sad. I have no idea why that is happening dear. But this cake is a little in the sticky side.